New research released reveals that Australian women are going grey younger than previously thought; with one in three women (33%) aged 18-35 finding their first grey hair before the age of 30. The study, conducted by Clairol Nice -N Easy to celebrate the Root Touch Up range, also revealed that on spotting their first grey hair the majority of women (65%) responded negatively to seeing it, with (63%) claiming they would feel unattractive, older and less confident if they had grey hair. Furthermore, as many as 65% of women would form a negative opinion about a woman they saw with root re-growth. Proving hair is an important part of a woman's appearance, root regrowth is considered to be one of the biggest beauty blunders (22%), with only hairy legs considered a bigger blunder (38%). So it comes as no surprise that a huge number of women (96%) who colour their hair at home count it as an important part of their beauty routine, with 79% stating they feel more positive after using it. 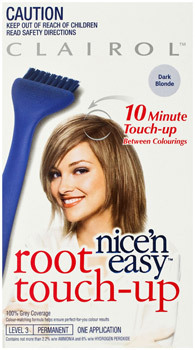 'Nice -N Easy Root Touch Up makes it fast, simple and inexpensive to cover unwanted roots. The colour matching system works with each strand's natural tones for a seamless colour match in just 10 minutes, providing a time-saving alternative to a full home colour or trip to the salon. It works with many shades in the Clairol Nice -N Easy collection and can even match other at-home colourant brands and salon shades. Nice -N Easy Root Touch Up is the perfect way to help keep your hair grey free and looking its best", says Belinda Jeffrey, Nice -N Easy ambassador. Jane Wecker, Hair Care & Colour Portfolio Brand Manager for P&G ANZ comments: 'As a worldwide leader in hair care and colour, P&G is committed to delivering innovative products that improve women's lives. We've discovered that more than half of Australian women (55%) who colour their hair prefer to touch up their roots or use home colour between trips to the salon to save time and money. Clairol Nice -N Easy Root Touch Up offers a simple, fast and cost-effective solution that gives your haircolour a boost, blending your roots seamlessly to deliver 100% grey coverage in just 10 minutes." The study revealed the average woman spends $17 each time she colours her hair at home and $112 when she visits the salon to get her hair coloured. When the frequency of colouring and the average costs involved are combined, it is clear that the average women colouring her hair at a salon is spending more than 5 times as much each year at the salon ($547) than women colouring their hair at home are spending on home colouring ($104). All leading pharmacies and supermarkets nationwide. Got Greys? Let Nice'n Easy Lead You Back to Colour!